In 1904 in a newspaper in Billings, Mont. 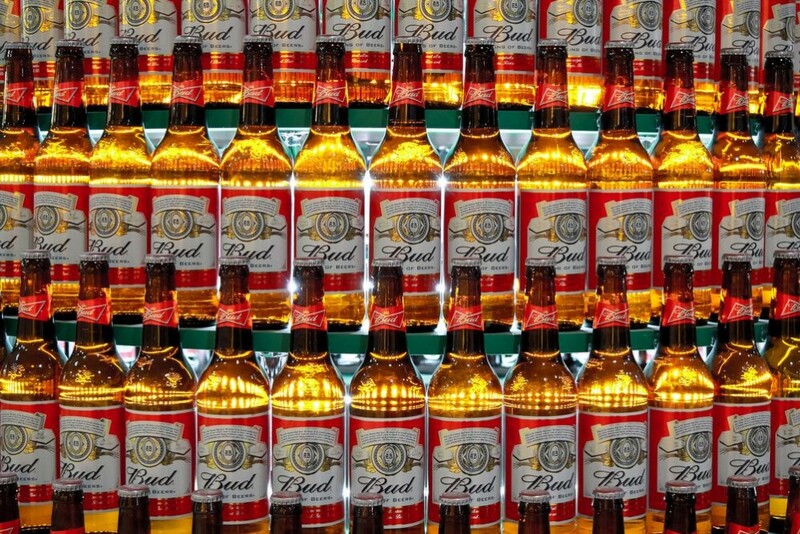 Anheuser-Busch advertised its famous Budweiser and gave it a new twist. The company referred to a recent study of medicines that showed many had a very high alcohol content. A-B invited the public to consider Budweiser a temperate and family drink in comparison and cited the alcohol content of the beer as “only 3 89/100 per cent. of alcohols” (3.89%). In an earlier blog entry I suggested this was effectively 5% abv (alcohol by volume). If you do the conversion, 3.89 abw equates to 4.93 abv, to all intents 5% particularly considering that final tallies for this purpose were never consistently accurate to the decimal point and fraction 100 years ago, nor are they today, for that matter. In this period too, there was no rule, particularly in general publications, whether alcohol was expressed by volume or weight, unless the writer told you. Where it is not stated, sometimes one or the other can be inferred from other data given especially starting and finishing gravities, that is, the ratio of fermentable and other solids in wort and beer to water. The ad in question doesn’t give such other data, so 3.89% alcohol could be either weight or volume. Initially I thought it must mean by weight, which equates to 5% alcohol in volume. I thought this because in 1884 a published analysis by the Kansas Pharmaceutical Association stated “Budweiser, St. Louis” contained 5.32% alcohol by volume. This was the strength of the beer as sold in Kansas. However, I now consider that in 1904 the 3.89% figure must have meant by volume. The reasons are as follows. In an 1889 company publication I mentioned recently Budweiser is described as “exceedingly light”. This had to mean in alcohol, not colour. The various beer descriptions use the term pale to refer to light colour, and frequently in Victorian times, light for alcoholic drinks meant light in alcohol. While alcohol content is always relative in different times with a correspondingly different view of what light and heavy meant, it is unlikely 5% abv was “exceedingly light”. This is because other analyses, both in America and Europe, show lager beer then was frequently approximately 4% abv, sometimes less, sometimes a little more. In a time when litigation occurred in various places whether lager was even intoxicating 5% abv, the standard of commercial (and much craft) beer today, would have been too strong for “exceedingly light”. On the other hand, 3.89% abv, just under the strength today of most light beer (4% abv), makes more sense as the true alcohol by volume of Budweiser in 1889 and 1904. Also, I was reading again a December, 2014 blog post by American brewer Mitch Steele, formerly of Stone Brewing and A-B. He reproduces a letter from Augustus Busch in 1893 which contains an analysis of both a Budweiser knock-off and A-B’s own, genuine Budweiser. The letter was written to brewing scientist Anton Schwarz in New York, whom we have met before in these pages. Clearly A-B was a client of Schwarz’ consultancy. In Busch’s letter A-B’s Budweiser is stated as 3.7% alcohol by volume. Therefore, 1904’s 3.89% has to be by volume also, factoring too the 1889 statement that it is “exceedingly light”. Where does this leave the 1884 analysis, of reputed source, that “Budweiser, St. Louis” was 5.3% abv? I think there are two explanations, one more plausible than the other. One explanation is the Budweiser analyzed in 1884 for the Kansas pharmacists was not from A-B, but rather was factitious, a knock-off. In the late 1800s it is true A-B was bedevilled with numerous counterfeits or passings-off of its product. The problem is referred to, showing sample offending labels, in the 1889 company booklet I mentioned. For example, even famed Fred. Miller Brewing Co. of Milwaukee introduced its own Budweiser, styled Original Milwaukee Budweiser, until a court in 1898 stopped it. But that beer was not sold until about 1891, before that Miller was distributing the real Budweiser for A-B in northern Wisconsin. Perhaps the 1884 Budweiser in the pharmacists’ journal was produced by another imitator? We can’t rule it out but I think this is unlikely. How else then to explain that 1884 Budweiser was stronger than certainly the 1893 Budweiser? I think the simple answer may be, the beer was reduced in strength some time after 1884. First, 1884 was only a year after A-B acquired rights from Charles Conrad Company to the beer. True, A-B had always brewed it, but initially for Charles (or Carl) Conrad who sold it originally as CCC Budweiser. Perhaps under Conrad the beer was stronger and as part of rolling it out nationally once it acquired full distribution, A-B decided to reduce the strength. The deepening Prohibition mentality in the country may have encouraged this step, and/or simple economics did. Pitching, too, to the female market – the 1889 hagiography refers to Bud as a ladies’ beer – may have motivated this strategy as well. Budweiser today, at least in Canada, is 5% abv – pretty much back to the presumed start point. For many years in the U.S. it was to my knowledge 4.8% abv. Effectively that is 5% abv and now I think it is an even 5% abv in the U.S. anyway. Note re images: the image above was sourced at this website, the Federalist. All intellectual property therein or thereto belongs to the sole owner or authorized licensee. Use believed available for educational and historical purposes. All feedback welcomed. Also, most of the true beers in the 1884 analysis, so excluding ginger ales and like, were higher in extract than Budweiser (1015). Only one was lower (1011) but Schlitz was 1016 and others more, up to 1026. So 1020 for Bud by 1889-1904 makes sense, it’s not a farfetched number and marries with the 1889 booklet’s “very strong in nutritive quality”. And Busch had to be right about the 3.7% abv because he gave the alcohol both by weight and volume, the conversion is correct for those numbers, and again the booklet states the beer is “exceedingly light”.